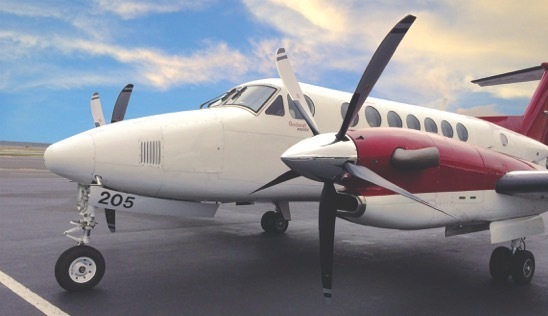 Las Vegas, Nov. 17, 2015 – Hartzell Propeller’s multi-year multi-million dollar development program for new turbine propellers gives owners and operators of many Beechcraft King Airs an opportunity to upgrade the performance of their workhorse aircraft. Hartzell’s new four-blade aluminum and five-blade structural composite props will be available in early 2016 for the sizeable Beechcraft King Air 350 fleet. The new aerodynamically swept props are designed to deliver a higher cruise speed, faster climb rate and shorter takeoff performance for the King Air 350 series introduced in 1990. Developed in conjunction with Raisbeck Engineering, which has begun FAA certification flight-testing on new four-blade aluminum and five-blade composite swept blade propeller designs for the King Air 350, the propellers incorporate Hartzell’s latest blade sweep technology already available for King Air C90 and King Air B200 models. Four-blade aluminum swept propellers for the King Air 350 began certification flight-testing in October, and an FAA STC is expected soon. Flight testing of the Raisbeck/Hartzell five-blade structural composite swept blade propellers will be completed in early 2016. Once complete, owners will have the option of choosing either the four-blade aluminum or five-blade carbon fiber performance enhancements. Raisbeck Engineering and Hartzell Propeller have a long-standing relationship in developing swept-blade technology for the entire King Air family. The results of this work provide increased across-the-board performance, a truly quiet environment and stunning ramp presence. Both versions of the newest Beechcraft King 350 props will be on display at Hartzell Propeller’s Booth C7629 and Raisbeck’s Booth N4900 during NBAA2015, held Nov. 17-19 in Las Vegas. King Air 350 owners can place orders with Raisbeck for the new props at the show. The new King Air 350 propellers are an extension of the swept blade technology already developed by Hartzell and Raisbeck for the King Air 90 and King Air B200 series. With the Hartzell/Raisbeck swept-blade propellers, overall aircraft thrust and efficiency are measurably improved for Beechcraft King Air C90GTx and other PT6A-135A-powered Beechcraft C90s. In addition, the new swept propellers lower cockpit and cabin sound levels.